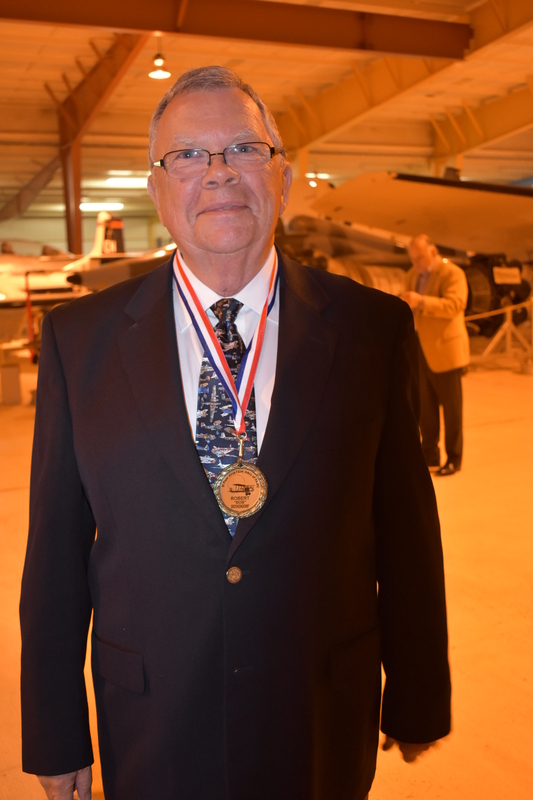 Long time FASF and EAA Member, Bob Dockendorf poses proudly with his new Hall of Fame medal about his neck. 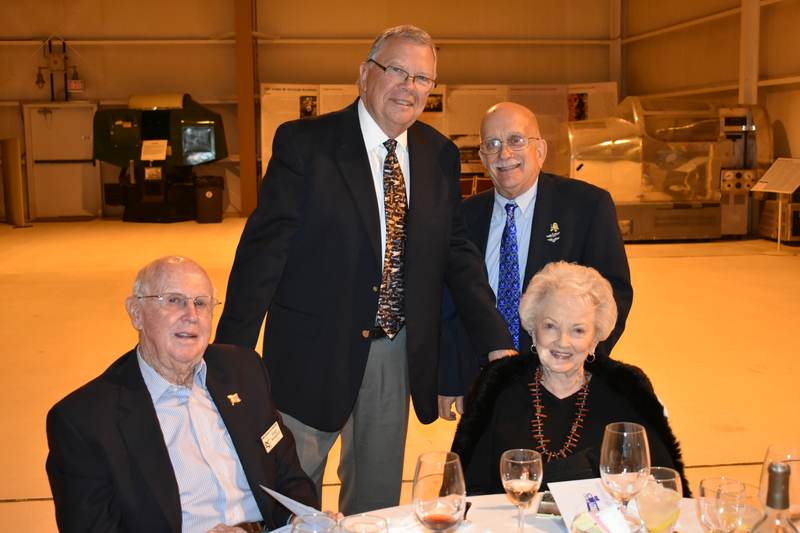 The FASF’s long-standing member from El Paso, Bob Dockendorf, has just been elected by the Board of Directors of the El Paso Aviation Association and the local Aviation Community to be inducted into the El Paso Aviation Hall of Fame. 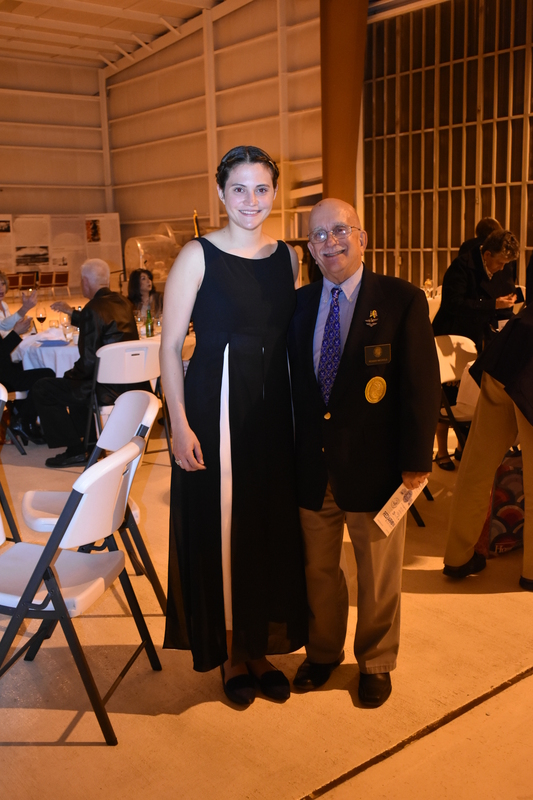 This past weekend celebrated this significant event with a special banquet, packed with area aviation celebrities and held at the Dona Ana Country International Jetport‘s famed War Eagles Air Museum (“WEAM”). Not just for his accomplishments as Director of WEAM, where, as its Executive Director, he has taken the historical facility to a new level of admirable excellence, but he was a key founder among the few local area aviators who started the highly successful new EAA chapter 1570 at the Dona Ana County International Jetport. He also directed the start of the John and Betty MacGuire student Pilot scholarship as part of that same EAA 1570 project. This student contribution provides both an aircraft and flight instruction for young adults up to and including their first solo flight. Those are but just a few of his aviation contributions to our local communities. Besides his personal membership in the FASF, Bob’s beloved WEAM is one of our proud Local Business Supporters, too. family to El Paso, Texas. 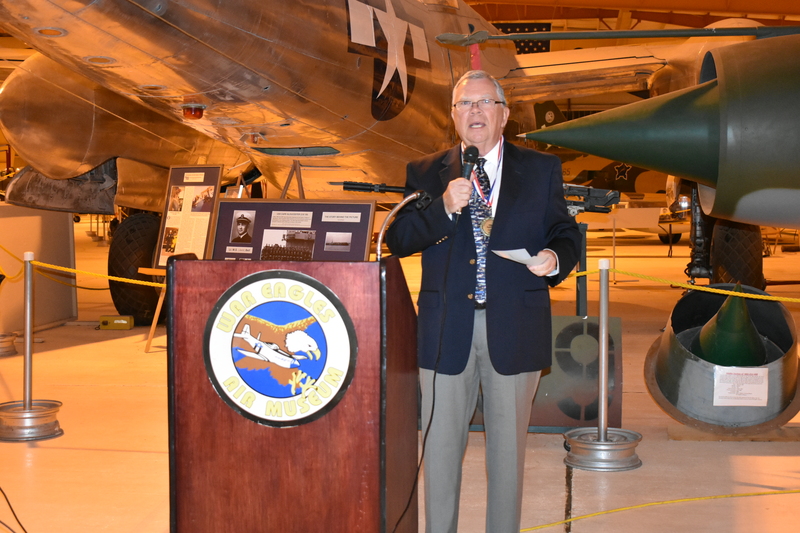 challenge to serve as the War Eagles Air Museum’s Executive Director. Teresa, New Mexico, adjacent to El Paso, Texas. 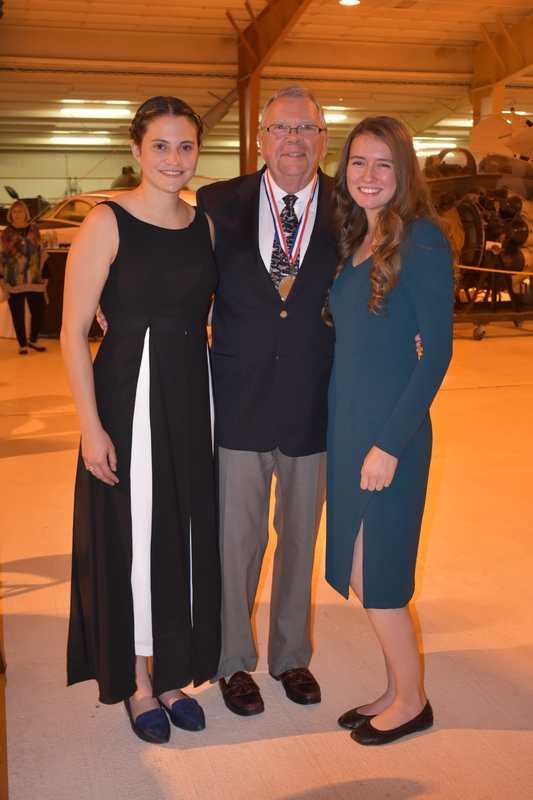 The following photographs were taken this past weekend at the ceremony and Banquet held in Bob’s honor, where Bob was inducted into the El Paso Texas Aviation Hall of Fame. 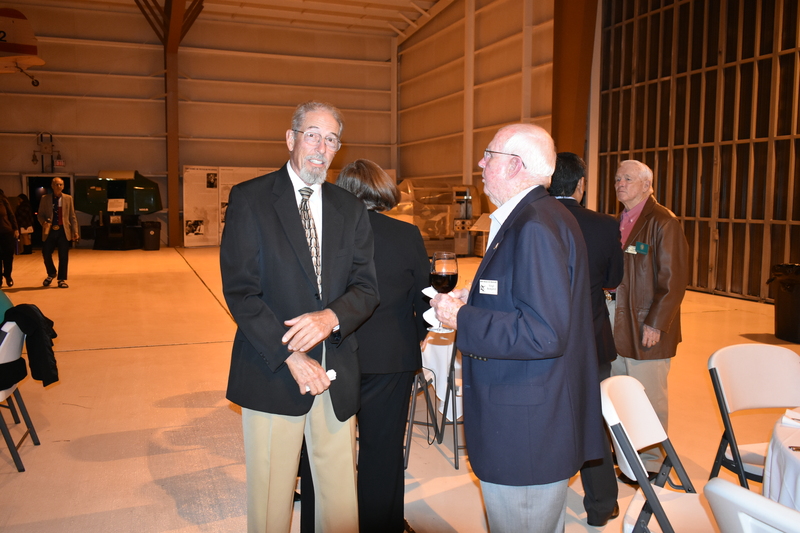 L to R: John Keithly, President of the EAA Chapter 1570 chats with Virg Hemphill, FASF Aviation News Scout and Volunteer Docent at WEAM. 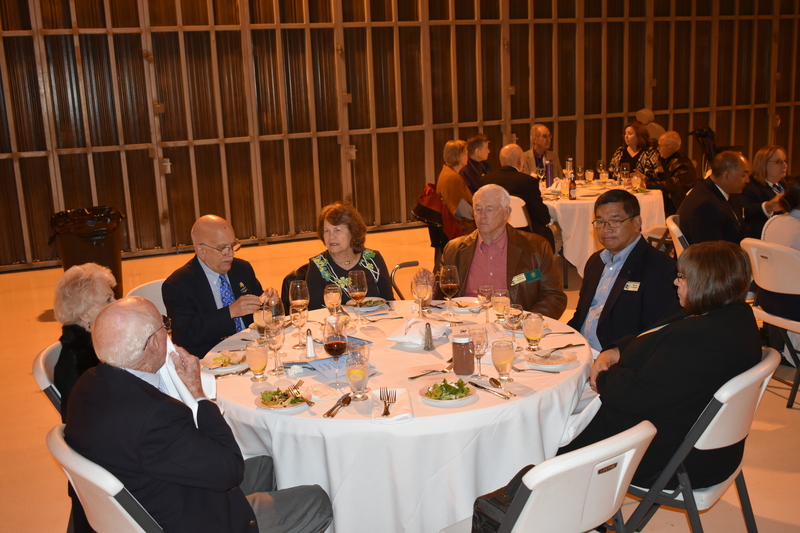 To Virg’s right in background, is FASF member and also Docent, Charlie Overstreet. L to R: Docent Charlie Overstreet talking with Mario Campos, also a Docent at WEAM. Both are members of the FASF. 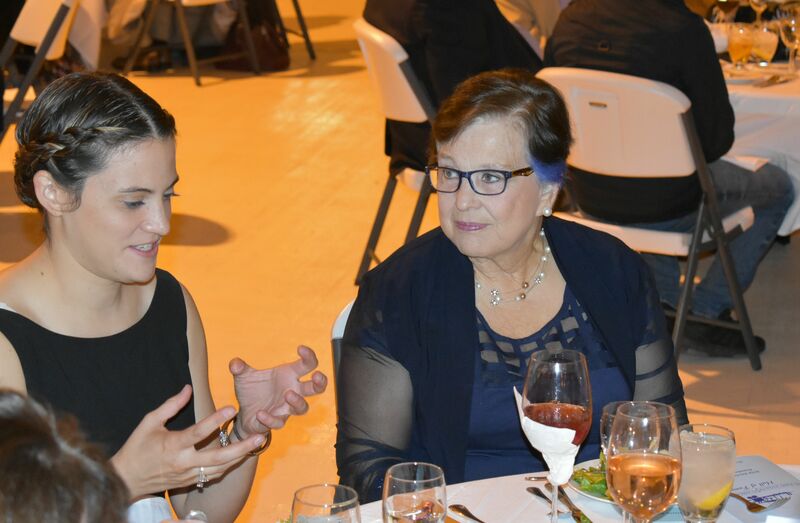 L to R: Ammber Valverde, Daedalian Aviation Scholarship winner, engaged in a lively discussion with her table mate, former El Paso, TX Mayor and renown local Aviator, Suzie Azar, who is also one of the FASF’s Advisors. Ammber is a Junior at the University of Texas El Paso (UTEP) and also a member of the New Mexico State University (NMSU) AFROTC. She plans to be an Air Force Pilot. L to R: at the Daedalian Society Table is: Virg and Jenine Hemphill, Roger Nichols, Mayre Sue and Charlie Overstreet, and Mario and Judy Campos. All are active FASF members. 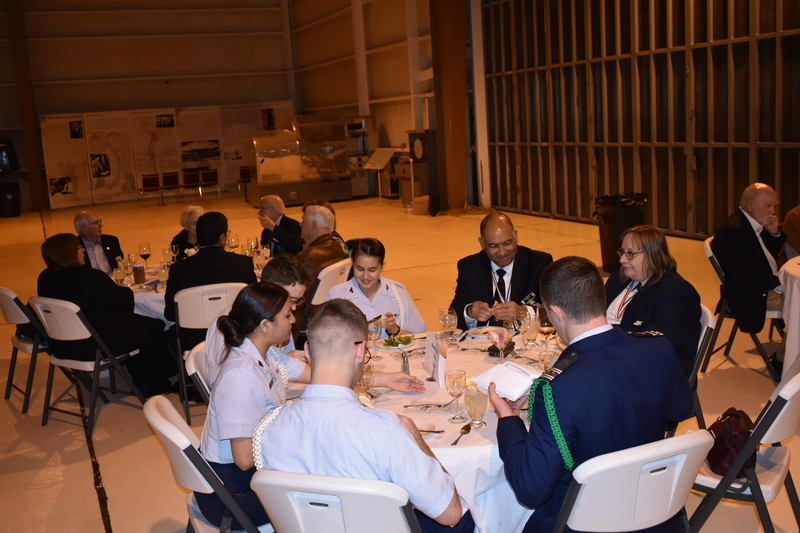 The El Paso CAP Table with two prior Hall of Fame awardees, Roland and Debbie Torres, along with their Cadet Honor Guard: From (R to L), Cadet Captain Hunter Spier in Dress Blue uniform, and C/CMSgt Jonathan Herl, C/Amn Eryal Martinez, C/MSgt Daniel Erives, , and C/A1C Vida Rote. This is the group of CAP Cadets who conducted the Flag Ceremonies at the opening and closing of the event. L to R: Virg Hemphill, Honored Hall of Famer, Bob Dockendorf, Roger Nichols, and Jenine Hemphill. Bob Dockendorf after accepting the Hall of Fame Award, speaking to the guests. View of the tables and attendees at the Banquet. 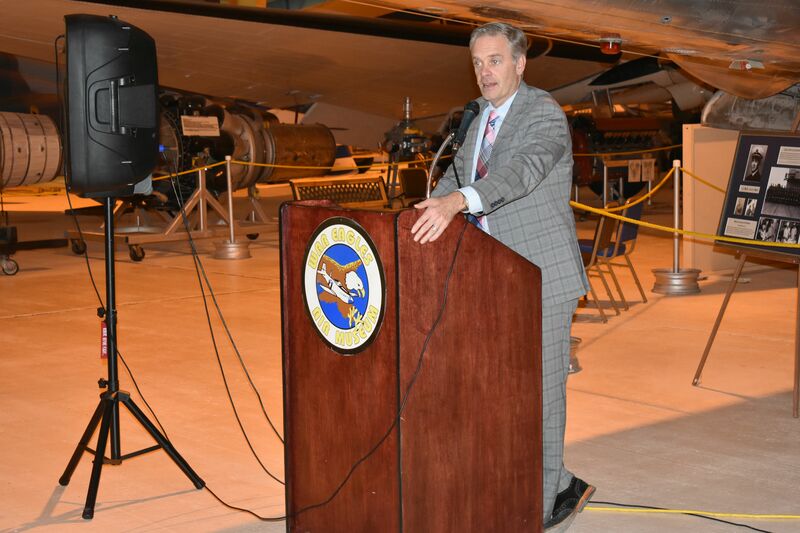 Guest speaker and aviation enthusiast, “Doppler” Dave Spielman, long time Chief Meteorologist for the ABC Network TV Channel in El Paso, TX, KVIA. 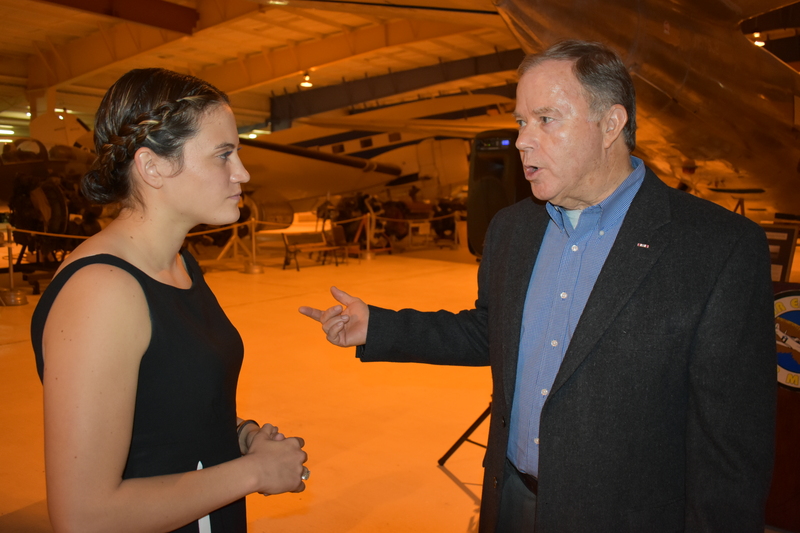 Amber poses with Mr. Dockendorf along with Laura Ditlevson, former winner of the EAA MacGuire Student Pilot Scholarship. 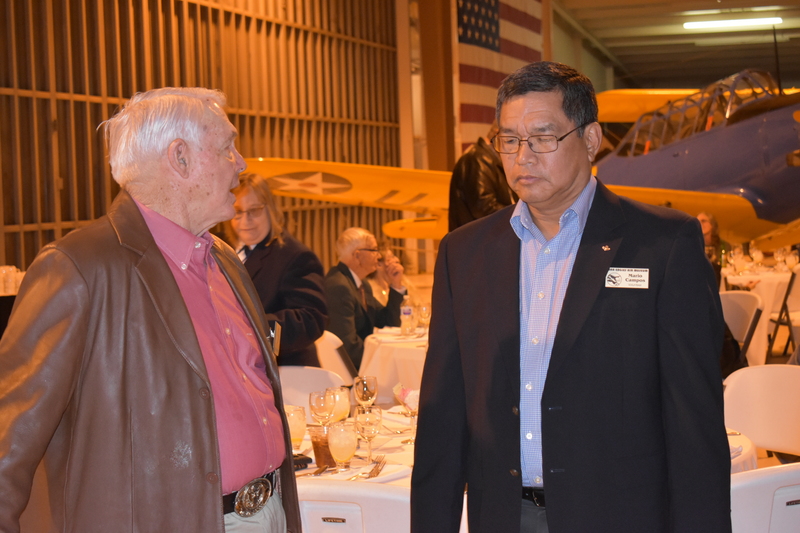 Ammber intently listens to former FASF Trustee and present FASF Advisor and Chair of the Dona Ana County International Jetport’s Board of Directors, Col. John Orton. An ex USAF JAG officer, John continues to fly his own Experimental Aircraft. This entry was posted in AVIATION NEWS, HOT NEWS! and tagged "Doppler" Dave Spielman Chief Meteorologist, Ammber Valverde, Aviation Hall of Fame, Award Ceremony, Banquet, Bob Dockendorf, C/A1C Vida Rote, C/Amn Eryal Martinez, C/Capt Hunter Spier, C/CMSgt Daniel Erives, C/CMSgt Jonathan Herl, CAP, Charie and Mayre Sue Ovestreet, Civil Air Patrol, Col. John Orton, Daedalian Society, Director of Operations, Dona Ana County International Jetport, EAA Chapter 1570, EAA Chapter 555, El Paso Aviation Association, El Paso Composite CAP Squadron TX-215, Executive Director, Flight Captain Roger Nichols, George Guerra, John and Betty MacGuire Student Pilot Scholarship Fund, Juan Brito, Mariano and Judy Campos, Mayor Suzie Azar, Rolando and Debbie Torres, Virg and Jenine Hemphill, War Eagles Air Museum, WEAM on November 13, 2018 by FASFRIC. Thanks to Ric Lambart for this great coverage of one of the best Local Aviation Events in the El Paso area in a long time! Thanks for your compliment, Virg. It really was an inspiring event, and Bob certainly earned his place on that Hall of Fame Plaque!